lmu is an UML class diagram editor. It main features are the automatic generation of high-quality UML class diagrams, and the analysis of pre-existing code. lmu is based on an ad hoc language dedicated to describing object-oriented models. 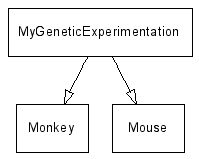 Out of such an object model description written by the user, or imported from existing JAR files, lmu is able to produces automatically-balanced highly aesthetic UML class diagrams. lmu is not a full-featured object-oriented IDE, nor it features an integration in Eclipse. Instead it comes with the minimum set of features useful in the creation of UML class diagrams. These features include a console mode and a basic IDE enabling the user to define his object-oriented model in a WYSIWYG fashion.